Yesterday was a very exciting day. I spotted rhubarb in our local Tesco! This only ever happens once a year, so as soon as I see it, with a whoop I joyfully gather up a bundle. Unfortunately, the staff here usually don't know what this strange fruit is (although, did you know, it is often classified as a vegetable). Last year the cashier tried to charge me by the stick. It was going to cost me approximately £25! 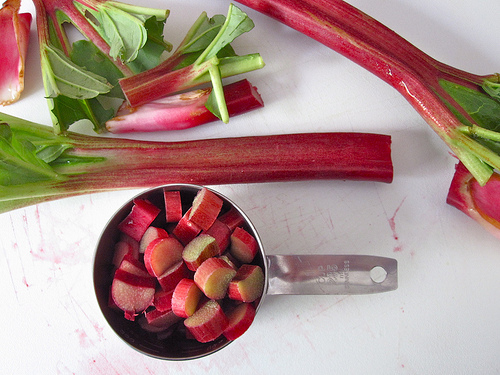 I mean, I like rhubarb, but not that much. The situation attracted the attention of a couple of other cashiers, and the security guard; all plainly curious as to how one went about eating it. The weather has gone a little chilly again, so therefore a rhubarb crumble seems about perfect for a cosy evening, something to lift spirits a little. I'll probably use this recipe (if I feel extra lazy and can't be bothered to pre-cook the rhubarb) or this one. Mmmmm, a taste of home. Oooh, sounds lovely. Greek yoghurt an occasional treat over here. Next I am going to experiment with it in trifle - trifle being my latest fad. Trifle! I can't even remember the last time I had trifle. How do you usually make yours?